Rachel Caron, 13, left, dance instructor Cassie Pillsbury, center, and Brooke Black, 15, practice a routine for an upcoming recital in their Irish dance class at Thomas School of Dance in Bangor. Both Caron and Black started dancing at age three and wanted to learn Irish dancing because of their ancestry and the upbeat tempo. 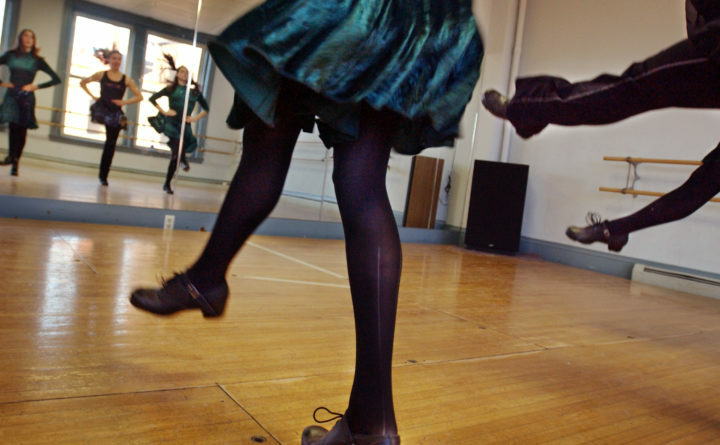 Shoes worn for the dances are made in Ireland from traces the girls make of their feet and send overseas. Scoff though you might at folks in fuzzy green top hats and light-up shamrock necklaces guzzling Guinness on St. Patrick’s Day this weekend, the fact remains that people of Irish descent have fundamentally altered the history of the U.S., and eastern Maine, specifically. Though Irish immigrants had begun to arrive in the U.S. prior to the 1840s, it was between 1845 and 1855 that more than 1.5 million Irish people came to the U.S. fleeing famine and persecution in their homeland and seeking a new life in the young country — an exodus that today likely would be referred to as a refugee crisis. Those starving Irish immigrants arrived in North America on overstuffed cargo ships, most of which disembarked in the Canadian Maritimes and Quebec. From there, many made their way to large U.S. cities — Boston, New York and Philadelphia. But a number also made the trek to Maine, mostly to the state’s burgeoning industrial centers, including Bangor, Augusta, Portland and Rockland. Proof of this migratory influx can be seen in a monument that today stands on an island in Passamaquoddy Bay, off the coast of the Washington County town of Robbinston. Hospital Island, as it is now known, was home to a quarantine hospital that in 1847 became overwhelmed with Irish immigrants suffering from typhoid. It’s estimated around 400 people died in that outbreak. A Celtic cross memorial was raised in 1995 to honor the dead. In the mid-19th century, it was Irish workers who built the capitol in Augusta; built the railroads across the state; and cut stone in quarries in Rockland, Vinalhaven and Stonington. Many of the famed lumberjacks of Maine’s North Woods were Irishmen, as were the men sending the logs down the Penobscot to Bangor, then the world’s largest lumber shipping port. Women worked as domestic helpers to the families that profited off those booming industries. The friction between newly arrived Irish immigrants and established Maine residents, mostly of Anglo-Saxon descent, is well documented. Perhaps most vividly, it’s shown in the story of Father John Bapst, the Catholic priest in Bangor who in 1854 was tarred and feathered by proponents of the anti-immigrant, anti-Catholic insurgent political party, the Know-Nothings. Nevertheless, once the Know-Nothing fervor had abated in the late 1850s, the Irish in Maine and throughout the U.S. began to climb out of poverty and oppression, and make the slow ascent to the top of society’s ladder. In the Bangor area, St. John’s Catholic Church was built by Irish labor, Irish-owned businesses were starting to open and people of Irish descent were being elected to office — mirroring the rise of Irish-Americans in New York, Boston and Philadelphia, where Irish-Americans increasingly began to control city business. In the Bangor area, that legacy can be seen in well-known names, including Irish-American politicians including former Gov. John McKernan, a Bangor native; athletes such as mixed martial arts fighter Marcus Davis; clergy such as former Bishop of Portland Edward O’Leary, also a Bangor native; and musicians including Old Town native Patty Griffin. It can be seen in business names such as Geaghan’s Brothers Brewing Company and McLaughlin’s Seafood, and in new traditions such as the Bangor Celtic Crossroads Festival. So even though St. Patrick’s Day can sometimes be seen as merely an excuse to drink whiskey at 6 a.m., it’s more importantly an opportunity to celebrate the contributions, music, arts and culture of Irish Americans.